Today my pregnancy app told me that I'm officially in my third trimester, and even though I knew it was coming, it's still a bit of a shock. We just have three more months until we meet our little babe, and with every kick and roll I feel it gets a little more real. After five years, it's hard to imagine our life as a family of two coming to an end, and even though I'm SO excited for this new adventure with Lucas, I'm trying to savor each and every day I have left before our lives change forever. After two months of continual nausea during my first trimester, these past three months have been SO easy. I go in tomorrow for my gestational diabetes screening and (hopefully!) final ultrasound to check the placement of my placenta, so I'm nervous about both of those things and seriously hoping things continue to go smoothly from here on out! Nothing. Honestly. I feel like I’m eating almost exactly like I was before… except maybe cooking a little less. It's hard to cook when you're super hungry and tired. None, except my favorite frozen TV dinner (pad thai). I tried powering through and eating it in the first trimester when basically everything but chips and salsa sounded horrible, and it was the only time I got seriously seriously seriously close to throwing up. Since then, my brain associates that meal with that feeling and I haven't been able to get over it. I truly feel really good. A little achy when I sit at my desk for too long, but really nothing serious and I can't complain at ALL. I woke up in the middle of the night once with the worst Charlie horse I've EVER had. I always wake up with one in the middle of the night after I photograph a wedding, so I'm no stranger to how they feel, but this was about a thousand times worse than I've ever felt and it lasted FOREVER. At least five minutes. Legit made me cry, wish someone would chop off my leg, and had me questioning everything I believe about my life. Like how I can handle labor if I couldn't handle that because no exaggeration - it was 100% the worst pain I've EVER felt in my life. 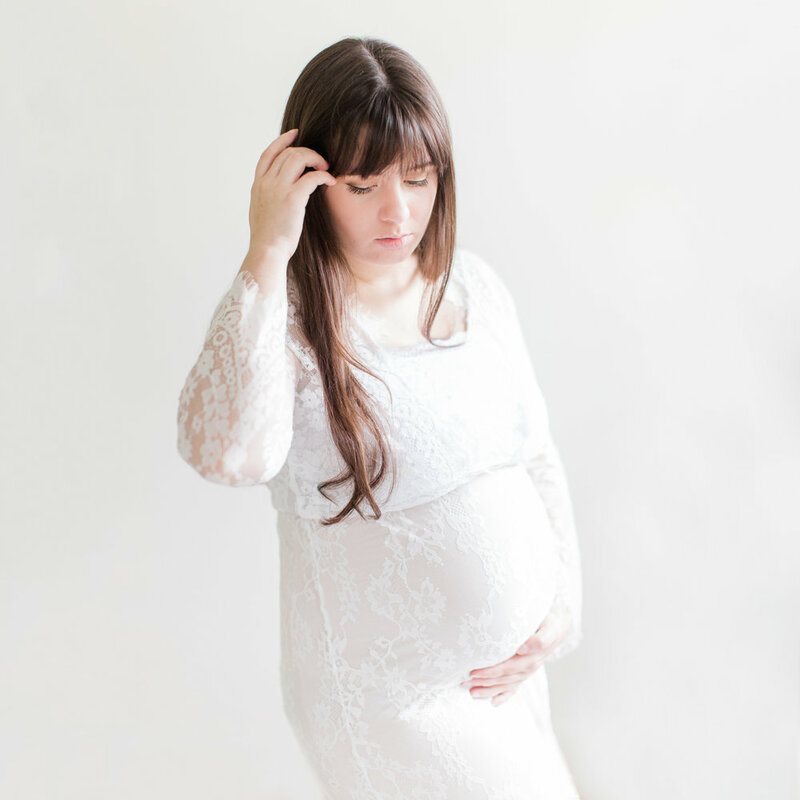 At the beginning of the second trimester, there was about a week where I was constantly EXHAUSTED, and I know that pregnancy makes you tired, but this was a tired that was BEYOND tired. I couldn't concentrate on anything and I just wanted to nap all day long. However, I started taking an iron supplement and almost immediately felt better, so I think I may have just been getting a bit anemic. Since adding the iron supplement, I've felt great! I literally haven't bought anything. A few cloth diapers and that's it… but we just have a few more weeks until we qualify for the amazon completion discount, so it seems silly not to wait until then and save 15%. I've wanted to keep our purchases as minimal as possible and only get things that we really love and will use, so it's made sense to me to wait and plan things out carefully so we don't end up with too much stuff. Will you show us the nursery? I also haven't done anything to the nursery. But, I mean, we have three months left sooo that's plenty of time, right? And baby won't even be in there for several months, so I don't see the point in stressing out over it. Obviously, the "nesting" instinct hasn't kicked in yet, so who knows how I'll feel once it does. Maybe I'll finally feel inspired to caulk and finish our baseboards too, haha! What does it feel like when the baby kicks? Have you seen any movement yet? I didn't feel baby Nunley kick regularly for a long time, and it's just now getting to the point that I'm feeling it all. the. time. To me, it literally feels like someone moving around and poking you from the inside… exactly how you would imagine it would feel if you had a person living inside of you. Occasionally, I can see my stomach moving around with each kick, but it's not as obvious for me as it is for some people. We're officially keeping it a secret for now. :) I didn't want to find out the gender at all, and we last minute decided to find out the day before our 20 week ultrasound, so it felt like a good compromise to find out but not tell anyone else. And I'm really glad we do know - it's been super helpful to wrap my mind around the fact that we're having a real human baby with a real human gender, instead of referring to baby as an "it". Thank you so much for being invested in our lives as we transition to a family of three… you all mean the world to us! !